My life right now is anything but normal. I think that is a great thing! In the end of March, beginning of April we got a phone call that was a bit unsettling…our landlord of almost 5 years said that he loved having us as tenants and it was time for him to sell the home we have been living in. for a split second my heart went crazy and then this incredible peace just took over. I felt impressed not to look for a place yet. For those of you who know me, know that I am a doer…not a ‘waiter’ (meaning, waits for things to happen). To trust and wait…that was no small task to be asked to do. So, I did. I was told by more than one person that, “Faith without works is dead.” And I would explain that my ‘work’ on this journey was to trust…which for me, has been by far the hardest work…searching and going to look at places would be a walk in the park…yet, I knew what I knew and couldn’t deny the prompting to trust and watch God work in my life. So, we waited through most of April, telling everyone we knew that we were looking…then the ok to look for a place came. We were very prayerful about it. Through experiences, we knew we were not going to rent anymore, we were going to purchase a home! What a blessing! We have rented for almost 5 years, our finances were not in the best shape and now we can buy! Wow! What a treat! That is the beginning miracle. Then we went to see the other places that were in our price range (amazing what you can qualify for and what you can make payments on…we chose to go with what we were comfortable with money wise) did you know the “Joneses” are broke? No sense in trying to keep up with them 🙂 . Every place felt awful! It didn’t have what we needed or it would take an awful lot of work to get it to where we could live with it. So, Kurt met us at the last place because it looked great on paper and the location was where we would like to be (it was the worse one of all) and we took him to the first place. We walked through it and even though neither of us was crazy about the idea of living in a townhouse, it is where we are supposed to be. That very night we put an offer on it. One day out and the place was found. Now…we didn’t look for weeks. Had I not listened to the prompting, it wouldn’t have been there. We had an amazing inspector, Harvey, he knows his stuff, old school and very knowledgeable in his craft. There were several small and some big things that needed fixing, glad Harvey was watchful of that. We had put in the offer according to our due diligence. So, when we went back to the seller, we asked she did the things we thought were needed. So she did (sort of…this is good, it works well at the end). Our financing of it…there is a program that if you qualify, you can have 2 mortgages and no down payment, the second mortgage is the down payment. We qualified for it, that was a miracle in itself. The loan officer is a good friend of the family, he went the extra mileS that needed to happen to make sure we got the best interest and that everything went smoothly. I had to supply a letter that proved my income from my contractor (I am a contractee, a cartographer that uploads trail maps on Google Earth and then on to a software), well, he was out of town for almost 2 months on to hike Makalu which is near Everest, his son had a car wreck while he was gone and I needed this letter 2 days after he got home. I really didn’t want to bother him. So the thought came to call the gal that trained me and explain the situation…she wrote the letter and paper work kept on going forward. Miracle! Then the underwriter said that if we kept making the same amount of money as we are making right now, we wouldn’t qualify by $50.00 too much income. Soooooo, my loan officer went to work on figuring out how we could make it happen. Well, the solution was, at the end of 2013, the second half of the month is paid on the January paycheck. So, if you subtract that, it works. I call it another miracle. The seller lives in Italy, she was stressed out and wanting to sell the property asap. The things needing fixing were not helping, she had no money to do them and they need it done to pass any inspection…so, when she counter back the offer, with a little bit more money to do the fixings, we agreed. There was a holiday in the way, Memorial Day. We are rushing to close soon, blessedly she was in town from Italy and was able to scramble and get most of the stuff done. The big things got done, some of the little ones didn’t. Because we got a lower interest, the financial institution had a policy of 2 days waiting period. So, although we could’ve closed a day early, we are closing a day later than expected and not a thing we can do about it. Or so we thought. We were planning to close on thursday, it would fund on friday and we could start doing the stuff that needed done on Saturday. Kurt wants to sand the counter tops, he is a counter top guy and needed to do that for his own sanity before we moved in, it is a 3-4 hours job; There are shelves in the garage that need to be removed; there is a storage room that has counter tops and cabinets…I need them gone to store all my buckets of grain; I need to clean everything…it is a need, not a want and we need to add a bar to the closet, so we can have more hanging room. Needless to say, closing on Friday, doesn’t fund until Monday (which is when we planned on moving) and it would really mess up our plans. Remember the seller didn’t get everything done? I called our realtor and asked if we would forgo the fixings they didn’t get done, could we have the keys on Saturday. Because she is the negotiator that she is, we get the keys on Friday after closing! Hallelujah! Another great miracle! Now, as you read this story, you either saw the hand of God in all of it and all the miracle workers or think we are the luckiest people on the planet. I happen to know luck doesn’t exist. There are no coincidences, there is no by chance…everything happen for a reason or two that we can’t see. I am grateful that as we exercised faith, the Lord brought His miracle workers to make our impossibilities hiccups on the greater scheme. Yes! 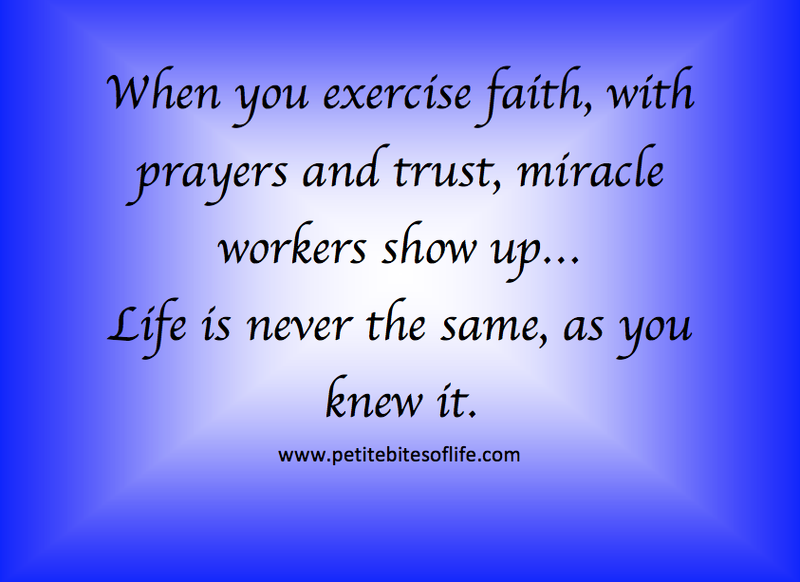 Miracles happen every day. We just need to look for them!